The Los Angeles City Transportation Department (LADOT) has a plan to expand transit services, including expanding DASH and CityRide, and trying out a microtransit pilot. The proposed expansions are not yet fully funded, though they could get partially underway using some transit expansion funds in the current fiscal year budget. The proposal is part of LADOT’s transit service analysis – an effort that got its start with a city council motion approved in 2014. LADOT held public workshops and received public comments from 2015-2016. LADOT General Manager Seleta Reynolds delivered a summary presentation of the department’s transit service analysis recommendations at yesterday’s L.A. City Council Transportation Committee. 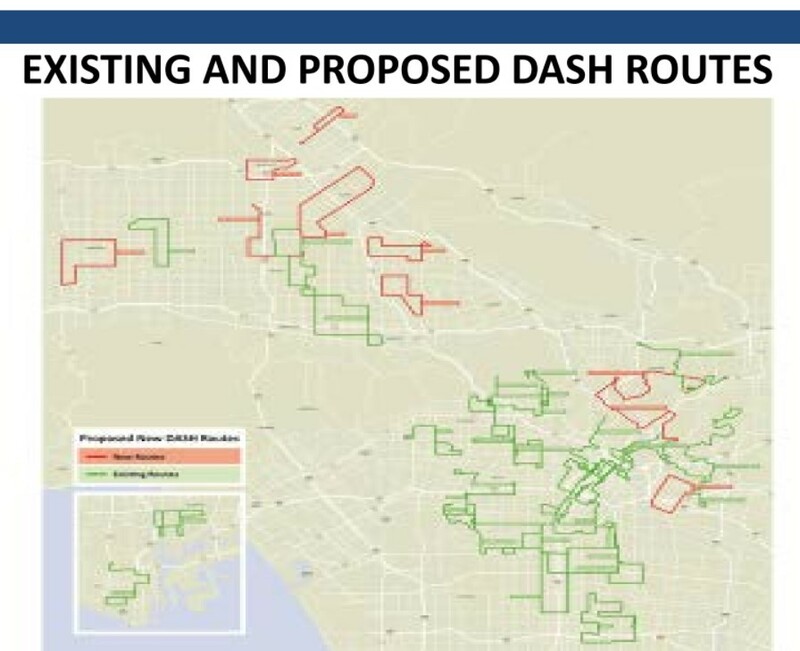 LADOT also recommends ten new dash lines: Boyle Heights, Canoga Park, Elysian Valley/Cypress Park, Glassell Park/Highland Park, Mission Hills, North Hollywood, Pacoima, Sun Valley, Sylmar, and Van Nuys/North Hills. Individual route map PDFs are available on the LADOT Transit website. The analysis recommends improvements to CityRide, the city’s shuttle service for seniors and disabled persons. Improvements would include increased subsidies for both shuttle and taxi rides, and updated policies for better efficiency. LADOT is also proposing a demand/response microtransit pilot project that would operate somewhat similarly to Lyft/Uber ride-pool services where folks use a smart phone app to hail rides. 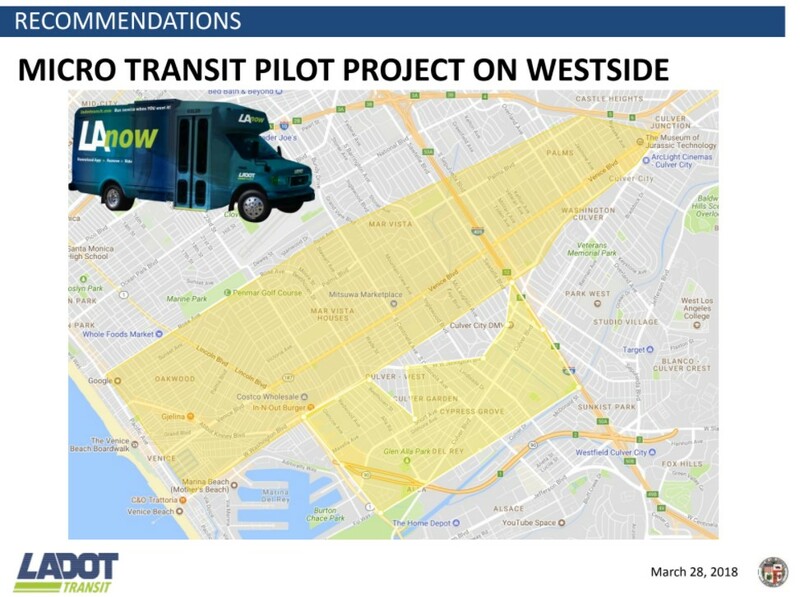 The pilot would operate in an Westside service area roughly centered on Venice Boulevard, extending from the beach to the Palms and Culver City Expo Line stations. The question that remains is how to pay for LADOT’s recommended expansions. There may be some state funding available, especially for transit capital via California cap-and-trade and/or gas tax funds. One downside is that LADOT estimates that new electric bus vehicle procurement (needed for new DASH routes) will take 12-18 months. I think these recommendations were done a while ago, no? Like, the new routes were announced over at least a year ago. LADOT would do much better to strengthen its existing dash routes rather than creating new ones. The 15 minute minimum headways suggested is an improvement over the uselessness of most dash routes today, but still to little for a neighborhood circulator. Minimum 10.